Large-scale production of motor-cars is made possible by the specialization and organization of a vast number of engineering processes. The building of Morris cars affords an excellent example of the methods adopted in the industry. THE BELT CONVEYER in the trimming shop carries finished components to the store. In the trimming shop various fittings for the interior of the motor car, such as seat cushions and squabs, are made up. Among the tools are electric knives which can cut through a hundred thicknesses of leather at a time. The organization of this department is typical of the modern methods applied in every branch of the Morris works. THERE are about 19,000 components in an average Morris motor car, made by some 300 separate manufacturers. These multitudinous parts are brought to the assembly plant at Cowley, Oxford, the headquarters of the vast organization built up by Lord Nuffield. Here they are assembled into fleets of motor cars. A visit to these engineering works, which cover 124 acres, is an unforgettable experience. Having followed for hours the stages of assembly, the visitor leaves with a dominant impression of the care and skill that go to the making of a motor car. The continuous flow of the process, from the moment when the frame of the chassis starts on a long; journey collecting engine and working parts until its meeting with the body, is a wonder of our times. The plant is capable of assembling 150,000 cars a year, or about 500 cars in a day of eight working hours. The spectacle of some 2,000 cars ready for delivery strikes the eye impressively in the dispatch department, but this large fleet represents the output of only four days. The huge plant is not the whole but only a part of a mighty organization which has grown in recent years from the enterprise of one man. Lord Nuffield. Lord Nuffield, then Mr. W. R. Morris, began his career by supplying and repairing bicycles, the fountain-head of his organization being the Morris cycle works and garage in Long Wall, Oxford. The gownsmen and townsmen of Oxford are great cyclists and in pre-war days the present Lord Nuffield worked with his hands repairing bicycles for undergraduates. He began the experiments which led to the building of the original Morris car and, in 1912, a factory was built at Cowley. Then the war of 1914-18 stopped the making of cars and the factory produced munitions. In 1919 Lord Nuffield had to begin all over again as a car manufacturer, but two years later the world depression of 1921 greatly reduced the demand for cars. This crisis marked the change in Lord Nuffield’s career. He was convinced that trade would revive and he set himself to produce a better car at a price within the reach of a wide class of people who would, he foresaw, take up motoring. Sales began to increase rapidly. In a period of ten years production increased from a few hundred to 65,000 cars a year. 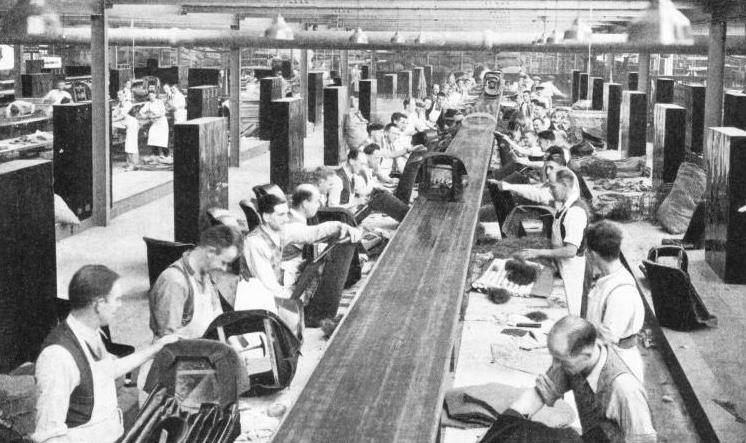 Meanwhile, methods, plant and works were continually being improved to keep pace with the demand. 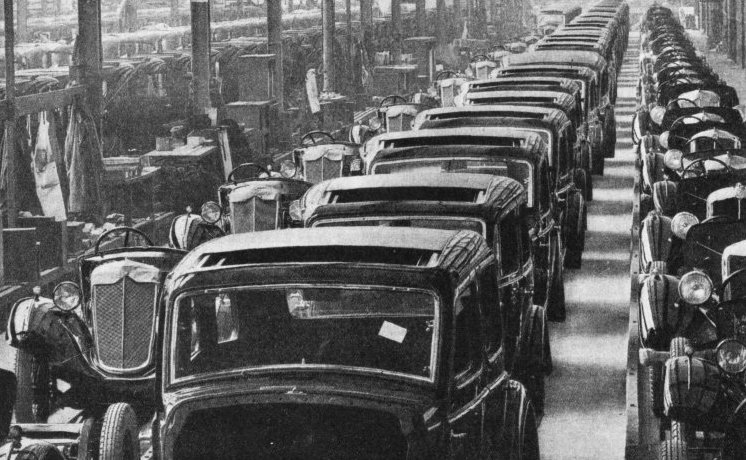 Then it was decided to extend the Cowley plant to assemble up to 150,000 cars a year and to derive full benefit from the system of specialized production in separate supporting factories. The Cowley plant is, therefore, the last link in a chain of operations some of the most important of which are centred in Coventry. At Coventry are the foundry, the engine factory and the plant for turning out coupe and van bodies. The radiator plant is at North Oxford. All the products, not only from these factories but also from the several hundred factories supplying parts and materials, are collected at Cowley to be assembled. Among the main tributaries which feed the mighty stream of production is the foundry, which covers 90,000 square feet at Courthouse Green, Coventry. This new foundry has entirely replaced the original foundry at Cowley. All the stages in the production of cylinder blocks, gear boxes and other castings follow a system of continuous flow. The foundry has been designed to deal with every stage in the production of certain motor car parts. Raw material enters at one end and passes to a machine shop at the other end, emerging as a completely machined unit which is taken to the engine factory in Gosford Street, Coventry. A WEATHER MACHINE which reproduces the effects of two years’ British weather in less than a fortnight is used to test the fabrics and paints required in making a Morris car. Samples are fitted into containers on the walls of the cylinder shown, and. are exposed to intense rays from the powerful daylight lamps above. Revolving jets of water spray the samples as if with rain. At the end of the test no fading should be visible to the human eye. At the cupola end of the foundry raw materials arrive by railway and by road, as railway lines and a private road are parallel. Railway wagons are shunted into the works siding from the LMS line and are handled by a 7-tons petrol locomotive. Coke and limestone, pig iron and sand delivered here are taken across the road by underground conveyers to their respective bunkers within the foundry. A magnetic crane lifts pig iron from the trucks to the storage bins. Sand for moulding is taken from the trucks and delivered to rotary driers, and the dry sand is delivered to the main bunkers by a bucket type conveyer. The range of furnaces consists of two cupolas of 4-feet shell diameter and throe of 5-feet diameter. A feature of the three large cupolas is a door-closing mechanism on ingenious lines designed by Morris Motors engineers. The pigs of iron, before they reach the cupolas, are broken to convenient size by a mechanical breaker. The core sand is drawn from the main bunkers and delivered to local bunkers near the core sand mixers. It is then taken from these in a measuring skip which gives the exact amount required. The core oil is put with the sand and the mixed sand is taken by conveyer to the core makers. When the cores have been prepared they are put on a steel belt conveyer which delivers them to the vertical drying stoves. The speed of the conveyer can be varied according to the type of core, the time taken for the cores to pass through the stoves being from forty-five to ninety minutes. Then they are placed in racks ready for inspection to ensure that they are up to standard. After inspection they are taken to the blacking sprays and they are then re-dried and delivered by a conveyer to the moulding lines. The assembler builds up the mould with accurate gauges in special iron boxes, and with an overhead lifting block places it on a platform conveyer which delivers the mould to the pouring station, where the molten metal is poured in. After this, still on the conveyer, the mould reaches the “knockout” station, where the moulding box is removed and re-delivered to the assemblers. The casting is placed on further platform conveyers, which are timed to deliver the casting to the final “knockout” station cool enough to handle. Here the cores are removed. Then the casting is placed on a roller track, where it is fettled with grinders and pneumatic hammers and delivered to the shot blast cabins. On it passes to the inspectors to be gauged with jigs, and then to the dispatch department for delivery to the machine shops. Before passing into the machine shops, which are adjacent to the foundry, the cylinder block is pickled in an acid bath, which finally clears away any odd particles of sand adhering to the casting. After a final cleansing in water, the castings then proceed to the machine shop, where the main faces are milled on large and powerful milling machines which weigh some 30 tons. After the main faces have been checked for accuracy, the cylinders proceed through their various boring, drilling and tapping operations, some of the machines drilling and tapping as many as seventy holes in one operation. Even with these multiple operations, a cylinder block passes through more than fifty machines before it is complete. 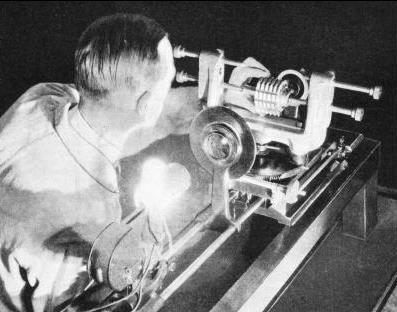 A SHADOWGRAPH PROJECTOR is used to test the accuracy of screw threads at the Morris works. A greatly magnified image of the screw is thrown on a screen so that any minute departure from correct size or shape can be detected instantly by comparison with an accurate profile drawn on the screen. Before dispatch to the engine assembly plant, the cylinder block is washed in boiling soda, and is inspected with numerous gauges to ensure perfection. The assembly plant is adjacent to the huge machine shops, which deliver to the assembly line the multiplicity of parts required to produce the engines. These are turned out at the rate of several thousand a week. Every effort is made to ensure cleanliness during assembly. High-pressure air jets are used to remove dirt particles from oil-ways. In addition, the various components are cleaned in paraffin or in a hot soda solution or, in some instances, by the degreasing process, using trichlorethylene. The last-mentioned process is a chemical one, which cleanses by means of a heavy vapour generated by steam pipes passing through the chemical bath. The cleanliness obtained by this process is remarkable. The production of one engine entails the handling of over 1,500 separate parts, on which there are approximately 2,000 machining operations. During the course of these machining operations there are approximately 600 inspection operations. An example of accurate production is seen in the finish of aluminium pistons. These pistons are finished to size with a diamond turning tool which produces a mirror surface un-approached for finish and accuracy by any other method. Piston and connecting rod assemblies are equalized for weight to within 2 drams to ensure freedom from vibration. Pistons are graded for size within 0.01 mm, which is less than half-a-thousandth of an inch. Crankshafts are balanced to extremely close limits on electrically controlled balancing machines, to ensure the highest degree of engine smoothness. Before being sent to Cowley each engine is tested on an electrical dynamometer. When the engine is first placed on the teat bed the dynamometer supplies the driving power to run off the initial stiffness. After this preliminary the engine is run under its own power and the dynamotor becomes the generator which applies a load on the engine under test, the amount of the load and thus the power produced by the engine being indicated on the dials attached to the set. While the engine is taking shape at Coventry the radiator for it is being made at the radiators branch at North Oxford. Here the automatic plating plant contains 3,000 gallons of plating solution. Components to be plated pass through an automatic degreasing plant and are then hung on conveyer bars. These first dip the components into a mechanically agitated bath of soap solution, then through similar baths of hot water, cold water, cyanide, cold water, acid swill and cold water, before they are introduced into the plating vat. After they have been withdrawn the components are cleaned by being passed through a mechanically agitated cold-water bath and finally through a hot-water bath. Chromium plating is deposited on a heavy nickel base of a minimum thickness of 0.001 in. Steel components are first given a heavy deposit of copper before the nickel base is deposited. As the radiator has such great effect on the efficiency of the engine the tests are particularly rigorous. Every radiator is submerged in a tank of water and subjected to an air pressure sufficient to bulge the top tank slightly to ensure that it is free from weak spots or leaks. 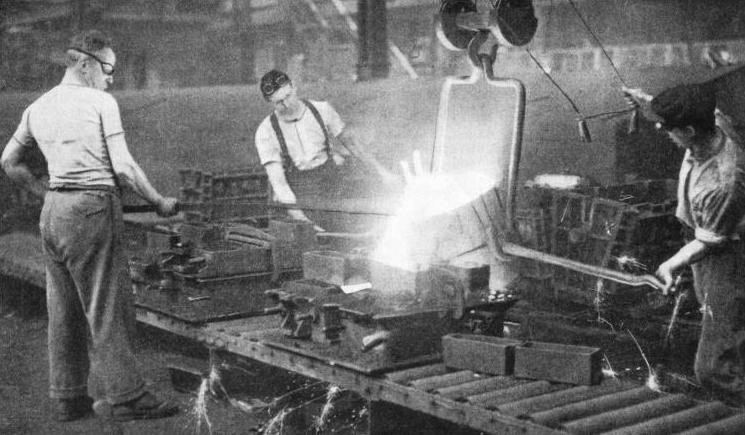 IN THE FOUNDRY at Coventry, cylinder blocks and other engine units are cast. The moulds pass along a platform conveyer to the pouring station, where the molten metal is poured in. When the casting has cooled it is subjected to a fettling (conditioning) process and cleaned before being passed to the machine shop. Experimental radiators are tested in a special plant. This reproduces all kinds of road and weather conditions likely to be experienced in any part of the world where a car can be used, whether in the tropics or in the Arctic, in a dead calm or in a ninety-miles-an-hour hurricane. The same car may be experimentally fitted with different types of radiator, with a view to obtaining the best result. The effects of changes of radiator can be noted on such points as the radiator temperature grading, the air temperature before and after the air has passed through the radiator, the horse-power of the engine and the petrol consumption. There is a hydraulic test to ensure the resistance of the radiator to pressure, and an expansion test, which involves placing the radiator into cold water and steam alternately for long periods. Radiators to be used in conjunction with water pumps are put through a water flow test. Then there is the vibration test. The radiator is bolted to a spring-loaded plate which is struck violently and rapidly by a mechanically operated cam which produces a “shake-up” more violent than that experienced on the worst road known to motorists. From time to time radiators are taken off the production line and drastically tested to make sure that they are up to standard. At Cowley the multitude of tributaries converges on the main stream, which comprises five main assembly lines fed with components by conveyers, overhead travelling cranes or sub-assembly lines. All components are delivered as near as possible to the point of assembly. Timing and organization not only ensure that parts are always at hand when wanted, hut also avoid large accumulations of stock. All parts are examined and checked before they are placed in the stores. By means of master gauges each part is measured as it arrives to ensure standardization and to make certain that no defective component reaches the assembly line. The testing laboratory at Cowley, with its array of instruments, checks all outside sources of supply. The laboratory tests are comprehensive. Samples from every batch of fabrics used for the interior trimmings of the car are subjected to a tensile test where the fabric is stretched until it breaks. The force required is then compared with the standard figure. The test for fading is carried out in a special machine which concentrates about two years’ English weather into less than a fortnight by the aid of intense artificial sunlight and varying degrees of humidity. Round the cylinder of this weather machine are scaled containers. Samples of fabrics are fitted into the containers and exposed to the rays of the daylight lamp and to artificial rain created by revolving jets of water. At the end of the test, if the sample is up to standard, no sign of fading can be seen by the human eye. The human eye test, however, is not sufficient. The sample is taken to another ingenious device, a mercury vapour lamp, whose rays immediately disclose secrets invisible in the rays of the sun. Fading or discoloration, otherwise invisible, is disclosed by the tell-tale lamp. This device is used to check fluids as well as solids. Samples are taken from black enamel, turpentine, oils, polishes and other supplies and placed in the rays, which reveal any adulteration even if it is as slight as 1 or 2 per cent. The difference, invisible otherwise, between the colour of the standard and that of the sample is shown by the revealing light. Horsehair, as used for upholstery padding, is first weighed and then boiled in a caustic solution which dissolves the hair and leaves any impurities, which may be present, unaffected. The solution is then filtered to isolate the adulterating materials so that the percentage of these can be determined. An ingenious electrical machine which checks the amount of moisture in timber resembles a radio receiving set with a pronged device attached. The amount of moisture in the timber is important, because if the wood is too damp it will shrink and warp after it has been fitted to a car, whereas should it be too dry it will lose its nature and strength. Before the wood is passed to the sawmills it is checked. The two prongs of the instrument are pressed into the timber, and if the moisture is not in accordance with standard the fact is indicated by a dial and a glowing light. 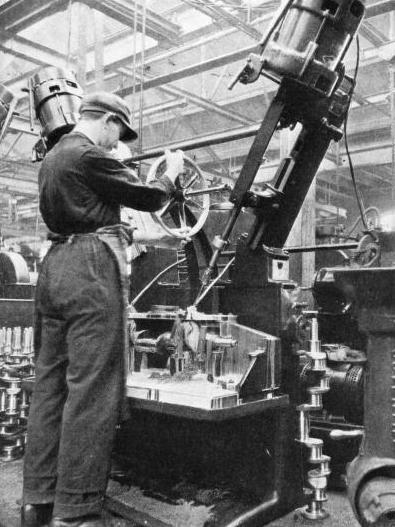 CRANKSHAFTS BEING DRILLED in the Morris machine shop at Coventry. Crankshafts are balanced to extremely close limits to obtain the highest degree of smoothness in the running of the engine. A single Morris engine unit contains 1,550 separate parts on which 1,930 machining operations are carried out, and is inspected 555 times. Less spectacular but also important are the glass jars in which wood preservatives are tested by bacillus cultures. Wood which has been impregnated with preservative is injected with the harmful cultures and placed in a glass jar. If the preservative does what is claimed for it nothing happens. If not, fungus begins to appear and to grow. Another device tests the carpet used on the floor of a car by reproducing the effect of 150 miles of walking on it. Comparison of the weight before and after the test enables the quality of the carpet to be estimated. Safety glass is tested by taking samples and dropping on to the glass a steel ball from a height. Rubber components have to pass a variety of tests. One instrument measures hardness or elasticity, another the breaking strain, and components have also to pass through the weather machine. Metals are tested by various methods and instruments, among which is a microscope that magnifies the structure of steel 4,500 times. A “steeloscope” is used for determining the composition of steels. 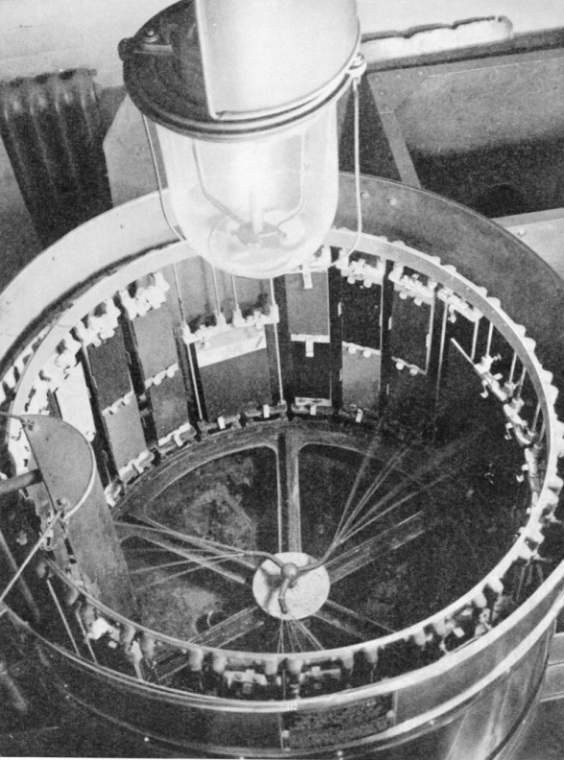 An electric arc directs light rays from the part under test into this instrument, where they are split up and separated into their various wavelengths. The separated rays are projected on to a viewing screen in the form of bright lines, the position and brightness of which indicate the composition of the steel under test. The operator can thus see the composition of the metal and he is able to confirm the normal lengthy process of analysis. Petrol tanks are fed on to a conveyer, where they are dealt with as they pass through the spray booth and treated with petrol-proof black lacquer. On the axle sub-assembly line the axles are fed into the finished axle store, where the axle for each model of car has its own storage racks. Here the axles wait their turn to be placed on a conveyer which will deliver them to the chassis assembly line. Wings, carriers and other components which need a hard black finish are received near the stove enamelling plant and fed to it by band conveyer. Then they are placed on a conveyer which passes them through a hot decreasing bath, a hot-water washing spray, a drying oven, an enamelling bath, and finally through the high-temperature oven which bakes the enamel as hard as rock. The wheels are dealt with in a similar way by a smaller oven, and wheels and wings are then examined and fed by conveyers to their destinations. The engine units arrive at Cowley complete except for a few accessories, and each is placed on a wheeled trolley in the store. Here the unit waits until a travelling elevator picks it up and delivers it to the engine sub-assembly line on a gantry, where the accessories are fitted before the unit is lifted out by a mechanical hoist and lowered into position on to the chassis in the main assembly line. Tyres are delivered to the tyre store near the wheel enamelling plant and tyre fitters put the tyres on the wheels with a speed which astonishes any motorist who has tried to do this job himself. The work of fitting the five wheels is done normally in one minute. On occasion it has been done in sixteen seconds. 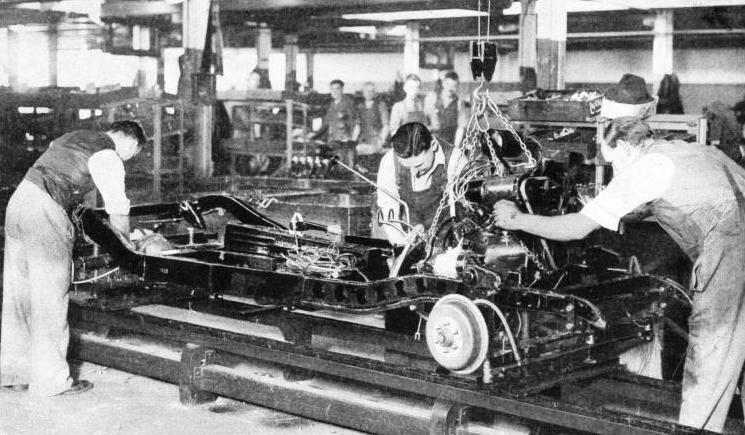 IN THE MAIN ASSEMBLY LINE in the Morris works at Cowley, Oxford, the complete engine unit is added to the chassis frame in one operation. A travelling elevator brings the unit from the store to the engine sub-assembly line, where the accessories are fitted. The engine unit is then lifted by a mechanical hoist and lowered on to the chassis in the main assembly line. A system of overhead travelling cranes brings all components to the main assembly line along which the chassis frame passes, gathering components on its way. The chassis frames are the skeletons upon which are built the completed cars. Each frame, on arrival, is taken by a travelling crane to its place in the store lines. At the appropriate time it is taken by crane to the drilling fixtures where holes, such as the engine bolt holes, are drilled. Then it is taken by conveyer to the chassis assembly line. Here, a mere skeleton, it begins the amazing journey during which it gathers the working parts of a complete motor car. In its early stages, the chassis frame is unromantic enough, but before it has moved many yards it receives in one operation the engine, back axle and propeller shaft from an overhead gantry. The main assembly line is fed continuously with the components by travelling cranes. These in turn are fed from a central gantry which obtains its supplies by conveyer in standard containers from the stores. Growing before one’s eyes until, complete with wheels, the chassis is finished, it is placed on a transveyer, which feeds it on to one of two conveyers. The conveyers take the body to the body-mounting shop and run parallel with a third conveyer which delivers trimmed bodies to the body mounting line, where the body is lifted on to the chassis. The wooden parts of the car are machined to close limits in the sawmill. An extractor plant consumes waste wood and supplies heat for the cellulose drying plant. Components such as roofs, body sides and doors are assembled into units and then delivered to the main body assembly line. Here they are joined to form the complete body, which is conveyed to the cellulose shop. The body is sprayed internally with preserving black and the metal panels are degreased. Then follows a priming coat, from three to six coats of filler according to the model, and a coat of stain, the body passing through drying ovens after each application. It is then rubbed down to provide a smooth surface and a sealing coat is applied, followed by four coats of cellulose colour. The body is now sanded, given a fine coat of cellulose colour and finally hand polished. This final polishing at first seems rather puzzling in a plant where everything is done with a minimum of manual labour, but hand polishing gives a depth and brilliance which cannot be achieved by any other process. HAVING left the cellulose shop, the bodies are placed on a body trimming conveyer, where the interior trimming is carried out, and items such as windscreens, window glasses, windows, louvres, roof-lamps, rear blinds, sliding heads, door pulls and pillar pulls are fitted. After this the body is equipped with rear wings, given another inspection and transferred to the delivery conveyer between the chassis conveyers. When the body reaches the end of the conveyer it is picked up by a travelling hoist and lowered into position on to its own particular chassis. The chassis, with the body in position, is delivered on to a transveyer and brought into register with the body mounting line. Some bodies are delivered complete from the body plant at Coventry to meet the chassis. Swiftly the body is bolted to the chassis, seat boards and floorboards, gear box and pedal dust excluders are fitted. Then the facia board and items such as windscreen wipers, seat runners, front number plates and sun visors are dealt with. The bonnet, seats, and other fittings follow and the complete car reaches the end of the line, where it is closely examined before it is passed to the testing department. Experts take the car on the road, test it and report, and any fault is rectified. Then the car is given a final clean and polish and is delivered to the dispatch department. In addition to the stores for the assembly plant there are stores of spare parts for every model of car. The offices contain records of every car sold and remaining under guarantee. The whole plant is a triumph of specialized production where each team of workers concentrates on its particular task and the work of all is co-ordinated. As much thought has been applied to the human as to the mechanical side, and the teams work at an even pace which produces the maximum efficiency. COMPLETED AND TRIMMED BODIES are brought alongside the finished chassis by a conveyer preparatory to fitting. A travelling hoist picks up the body and lowers it into position on its appropriate chassis. The Morris plant is capable of assembling 150.000 cars in a year, a figure which represents an output of about 500 cars in a day of eight working hours. You can read more on “Garage Equipment”, “Modern Traffic Control” and “The Story of the Motor Car” on this website.